The Clinton Organized Bar and Restaurant Association (COBRA) is holding a meeting tonight to discuss plans to move ahead with a lawsuit over the state’s smoking ban. 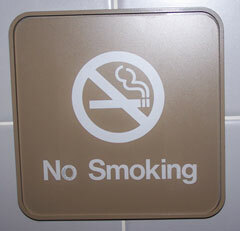 The new law takes effect July 1st and would ban smoking in most public places. COBRA president Jon VanRoekel says it’s a statewide effort. VanRoekel says they’ve invited vendors, restaurant and bar owners to Clinton for the meeting. "What we’re trying to do, is we’re trying to unite all the small business that feel that their rights are being violated, and bring them all together so we can be one unified voice in filing an injunction to stop the advancement of this law," VanRoekel says. Van Roeckl says the statewide effort is well on its way to having enough money to take the issue all the way to the Supreme Court. He says they’ve already raised enough funds in Iowa City, Des Moines, Cedar Rapids, Dubuque, Davenport, Cedar Falls, Council Bluffs and the outlying areas to have about 85-percent of the money they need. VanRoekel has an interest in two bars and owns a company that supplies pizzas to such businesses. He says it’s important that the smoking ban arguments be heard in court. VanRoekel says: "It’s obviously our legislators have a certain agenda they’re trying to broadcast, basically anti-small business, anti-grassroots, anti-bars, anti-restaurants and that’s kind of been shown. You know by their views on TouchPlay, their views on fire code changes, the fact that we are one of the few states that has state-mandated dram shop, we pay 100 percent of property taxes, increases in cigarette tax, and then the next year they try to come back and ban ’em." The new law exempts parts of the state license casinos from the smoking ban. VanRoekel says that’s one of the issues involved in the lawsuit, but he says the broad picture is they are the ones that save money or borrowed the money to start businesses and employ people, take all the risk and pay taxes to the state, "And by God it should be our right to make our choice, make choice that we feel would best benefit our businesses." VanRoekel says proponents of the ban says establishments in cities that banned smoking see an increase in sales. He says those numbers are deceiving, because the increase in sales for some is at the expense of those businesses that had to close because of the ban. "I find it hard to believe that our legislators in the state of Iowa are so much smarter than every single small business owner across the state of that can say that ‘if you eliminate smoking, your sales will go up’," VanRoekel says, "because, I tell you what, if I thought that eliminating smoking in any establishment that I own would increase my profit by one percent, I would have done it 20 years ago." The meeting is tonight at 5:30.